The Lee College chapter of the Walter Prescott Webb Historical Society has been named 2016 Chapter of the Year by the Texas State Historical Association (TSHA) for showing outstanding commitment and outreach within the community. Named for a distinguished University of Texas historian and former TSHA director, the Webb Society works through college and university history departments to encourage students to discover, research, write and publish the history of Texas as they find it where they live. Chapter activities focus on local, community and regional history. TSHA presents two Chapter of the Year Awards each year: one for a university, and one for a junior or community college. The 2016 award is the third time the Lee College Webb Society has taken top community college honors in the state. For more information about the Lee College chapter of the Walter Prescott Webb Historical Society, contact adviser Portia Hopkins at phopkins@lee.edu. BAYTOWN, TX — Students in the Lee College Honors Program have earned a coveted spot on a national academic team and been invited to present their work alongside undergraduates from around the world at a prestigious academic conference. Micah Bullard, a dual-credit student who will graduate from the college in May, has been selected a 2016 Coca-Cola Community College Academic Team Silver Scholar. Bullard is one of just 50 students in the United States to be named a Silver Scholar and will receive a $1,250 scholarship. A past recipient of the Dorothy Cooke Hayes Outstanding Honors Student Award and a recognized Honors Program completer, he intends to transfer to a four-year university following graduation. More than 1,900 students applied this year for the Coca-Cola Community College Academic Team. The program is sponsored by The Coca-Cola Scholars Foundation and administered by Phi Theta Kappa Honor Society to recognize high-achieving students at two-year colleges who demonstrate academic excellence, intellectual rigor, leadership and service that extends beyond the classroom to benefit society. The Lee College students, whose Honors Program instructors encouraged them to apply for the conference based on the strength of seminar papers they wrote in the Human Condition course, will join nearly 200 undergraduate writers and poets from throughout North America and beyond to share their work and learn from some of the most important writers in contemporary literature. Pulitzer Prize winners Douglas Blackmon and Kay Ryan will be the featured authors at the event. For more information about the Lee College Honors Program, contact coordinator Georgeann Ward at gward or visit www.lee.edu/honors. BAYTOWN, TX – A few years ago, Ken Booker — director of instrumental music at Lee College — reached a point where he began to consider no longer writing music. 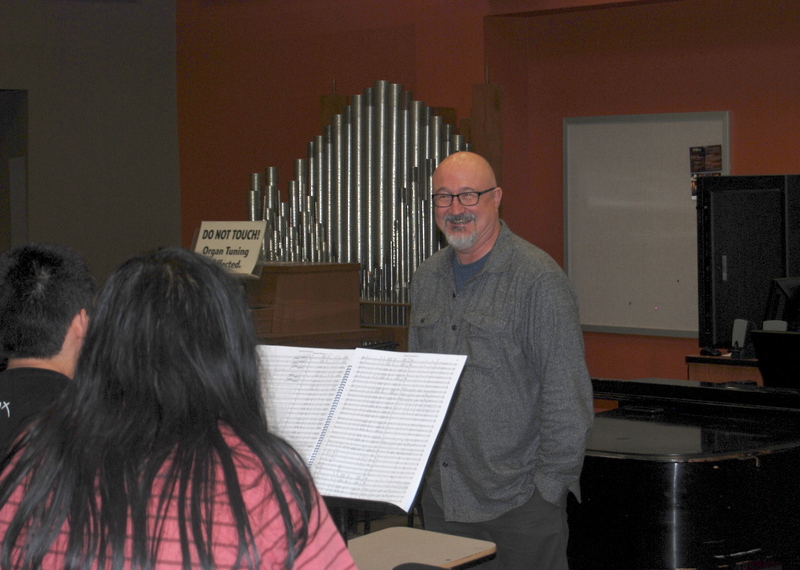 Dr. Ken Booker, director of instrumental music at Lee College, shares a sneak peek and insights about his original symphony with music students Monday, March 7, 2016, at the Performing Arts Center. The Baytown Symphony Orchestra will debut Booker’s composition, “Second Symphony,” on Saturday, March 12, at its Spring Tribute concert. This Saturday, the Baytown Symphony Orchestra (BSO) will premiere the first original work Booker created after emerging from that season of questioning and self-discovery: “Second Symphony,” a musical exploration of change and rebirth. Renewal and awakening will be hallmarks of the BSO “Spring Tribute” concert, which is set for 7:30 p.m., Saturday, March 12, at the Lee College Performing Arts Center. Tickets are available for purchase online at www.lee.edu/pac, or by calling the Box Office at 281.425.6255. A Nederland native who attended Lamar University and the University of Houston, Booker earned a doctorate in musical composition from the University of Texas. After starting his composing career with big band pieces, he expanded his repertoire and wrote and published across multiple musical genres. He describes Second Symphony as a 21-minute journey through a series of landscapes, each appearing to the listener in the form of musical episodes. Booker wrote “Second Symphony” at the behest of BSO conductor and musical director Dennis Eichler, who had long been an admirer of his work. Their respect for each other and excitement for the upcoming concert and debut of his latest piece is mutual, Booker said. BAYTOWN, TX — After winning last year the American Association of Community Colleges (AACC) Award of Excellence for Student Success, Lee College has now been named a finalist in three separate categories for the 2016 awards cycle: Exemplary Board/CEO, Faculty Innovation and Outstanding College/Corporate Partnership. The AACC Awards of Excellence recognize exceptional work among the nation’s two-year colleges. Winners will be announced in April at the association’s annual convention, being held this year in Chicago, April 9-12. The Exemplary Board/CEO category honors a community college whose CEO/Board of Trustees collaboration and working relationship are exemplary in promoting effectiveness in community college governance. Lee College was also named a finalist in this category in 2015. Treva Brown-Askey, chairwoman of Developmental Education, was selected as a finalist in the Faculty Innovation category, which recognizes instructors at AACC member colleges who have demonstrated leadership in the development and implementation of a campus program that has had positive impact on the learning experience for students. The outcome of the program should have resulted in the improvement of student completion numbers within a course or a degree field, and nominees are expected to demonstrate an ongoing commitment to student access and success. The Outstanding College/Corporate Partnership category recognizes local, regional and national collaboration between a college and corporate partner that has achieved demonstrable, multi-year success in advancing the mission of the institution, the economic prosperity of a community, region or the nation and the learning excellence of students.